In the absence of a theme due to a postponed ‘Wife’s Night’ (not as dodgy as it sounds), I was a little at a loss as to what to take to meeting number 18. I find themes really help me make my selection – my mind likes the process of sifting through the possibilities, rifling through its filing system looking for appropriate choices. 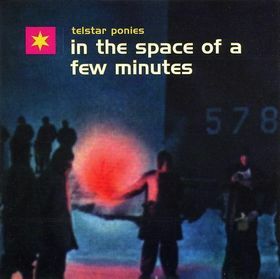 With no particular direction offered by Nick, I returned to Telstar Ponies’ 1995 offering – In The Space of a Few Minutes – a record I had previously considered for Nick’s ‘Under Appreciated Records of the 90s’ theme. Although ITSOAFM is not a record I turn to all that often, I always enjoy it when I do and view it as a little treat when it settles onto my turntable and unleashes it sound. ITSOAFM almost fits Rob’s possible future theme – ‘Albums Not Yet Reviewed on Allmusic’. There is no written review, but the site has gone to the trouble of awarding this album two stars! Pillocks! It makes me wonder whether they have ever heard it, especially when Mogwai’s constellations of stars in their discography is taken into account. I don’t own any Mogwai albums but I have heard enough by them over the years to realise that they do not sound THAT much better (if at all) than Telstar Ponies do here. In another, possibly better, world Telstar Ponies would be more than a footnote in the history pages of 1990s UK indie. I find their sound pretty much impossible to pigeonhole – first track ‘The Moon is Not a Puzzle’ reminded Rob of Sister-era Sonic Youth (see Round 16) but for me the influences are much less obvious and more distant. I hear traces of Slint and other early 90s post-rock bands and a little Neu here and there in the prepulsiveness of some of the tracks (second track, Lugengeschichte – try saying that when you’re drunk! – being a prime example). Occasionally David Keenan’s vocals sound reminiscent of Jim Reid or Bobby Gillespie, other times closer to, say, Mudhoney’s Mark Arm at his shoutiest. Rachel Devine adds a wonderful contrast on ITSOAFM with her breathy, warm and mostly spoken vocals and, to my mind, it all works a treat (unlike on the followup album, Music for a New Society, where she attempts to sing on a couple of tracks with decidedly mixed results). I find it fascinating that an album that garnered enough attention at the time of its release for me to want it, find it and buy it, that manages to so successfully appropriate its influences and mould them into something original and fresh and that has gone on to apparently influence relatively major groups (such as Mogwai and Godspeed YBE) has not managed to gain the recognition it deserves. It’s time the balance was redressed and that In The Space of a Few Minutes was welcomed into the rock’n’roll Hall of Fame with open arms. It deserves better than a measly ** from Allmusic and a few half-baked blog entries. Nick listened: Telstar Ponies are a name I’ve been subconsciously aware of for years. If you’d asked me before Tom put this on the turntable at DRC, I’d have probably said they were Scottish, and maybe had a vague connection between them and Teenage Fanclub in my head, but little else. I certainly don’t think I’d ever heard them though. Predictably, given that they’re my points of reference, Telstar Ponies sounded like the midpoint between Teenage Fanclub’s early, crunchier Americophile pop (before they got all wistful and harmonic, when their guitars chugged rather than chimed), and Mogwai’s doomed repetition. The problem with that equation is twofold; firstly, I find Mogwai’s elongated approaches and dramatic pay-offs too long and, as a result, predominantly unrewarding most of the time, mostly because they’re rhythmically unsubtle – not repetitious enough to get into a proper kraut groove, and not free enough to inspire surprise. This was definitely something Telstar Ponies suffered from; there were hints of krautrock but they seemed watered down and unexciting. Secondly, I felt like Telstar Ponies were neither fish nor fowl. The postrock-y workouts were musically nothing special when compared to Godspeed or Bark Psychosis or Tortoise, and the songwriting side of things, admittedly from only one listen, seemed to lack melodic sparkle, instead mining the same vein of intensity over and over again. Rob listened: Had I heard this when it came out, I would have adored it intensely and by now it would be filed alongside AC Acoustics, Lotion, Come, Drive Like Jehu and yes, Mogwai under an invisible heading of ‘Records Which Seemed World-Changing But Got Left Behind’. I’d glance at it every now and then and feel slightly guilty passing it over to listen to something else. In short, I liked it but had I got to it in time, we would have been great together.